William Shakespeare, being Shakespeare, took an ancient notion of dividing human existence into stages or eras, a popular motif in both literature and art, put to it his own writing talent, and even used the concept in more than one play. In much of his work, Shakespeare borrowed, refined, refreshed, created anew and made it immortal. Even the idea of life as a stage and men and women merely players playing a part extended at least back to the Roman poet Juvenal in the first century A.D. who used it to describe Greece and Greeks in Satire 3. 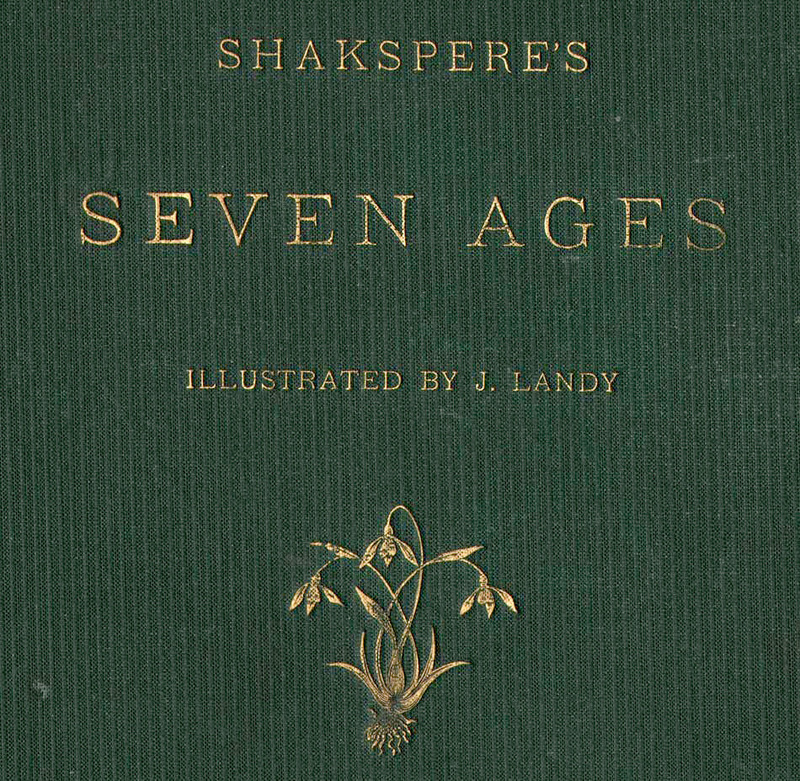 The “seven ages” of man penned by William Shakespeare in As You Like It became a popular theme in the 19th century when there was a virtual mania for anything about the bard – editions of his plays for both children and adults, etchings of his characters and stage settings, statues and commemorative collectibles. There were various literary takes on the subject as well as paintings, tableaus and photographic interpretations. 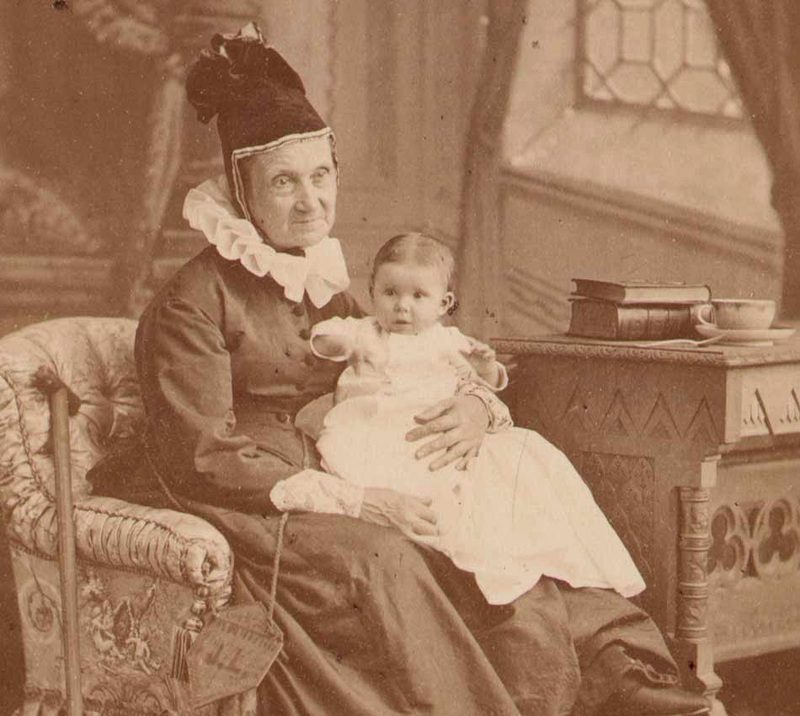 One of the most celebrated sets of pictures were those staged by Cincinnati photographer James Landy in 1876. He created them for showing at the Centennial Exhibition in Philadelphia that year, presenting them in three formats: a set of small cabinet cards, or cartes de visites, a set of large prints, and as a book with tipped-in photographs, published in Cincinnati the next year by the Robert Clarke Publishing Company. It is a copy of this book held by the Archives and Rare Books Library, part of the Enoch Carson Shakespeariana Library, donated to the University of Cincinnati by William A. Procter in 1900 (call no. SpecCol RB PR2883.L3). Procter also purchased and donated publisher Robert Clarke’s personal library as well. Landy’s book is formally entitled Shakespere’s Seven Ages of Man, Illustrated with Photographs from Life. The spelling of Shakespeare such as Landy used was fairly common at the time and interchangeable with what is the accepted spelling today. 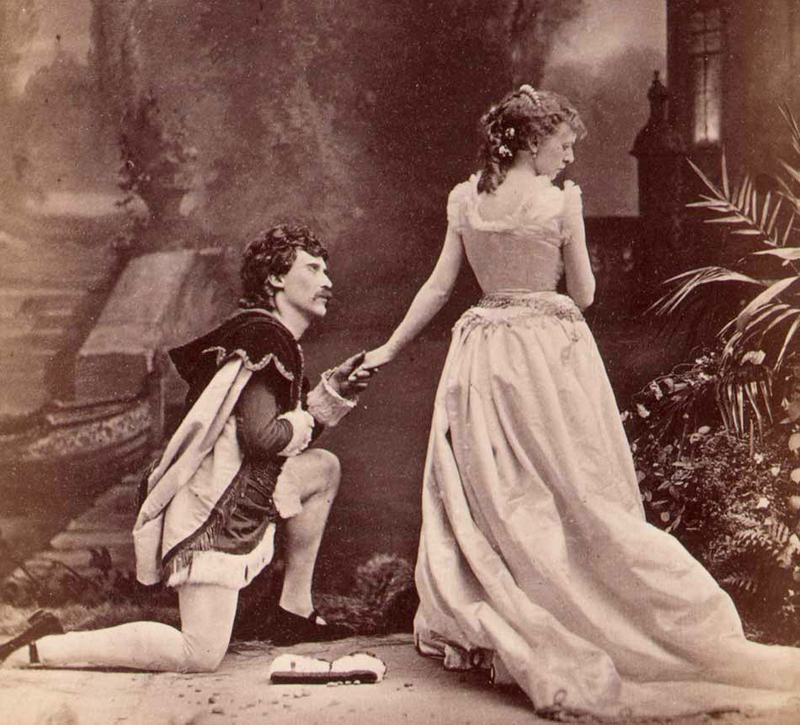 As a photographer, James Landy was very familiar with the passion for Shakespeare. 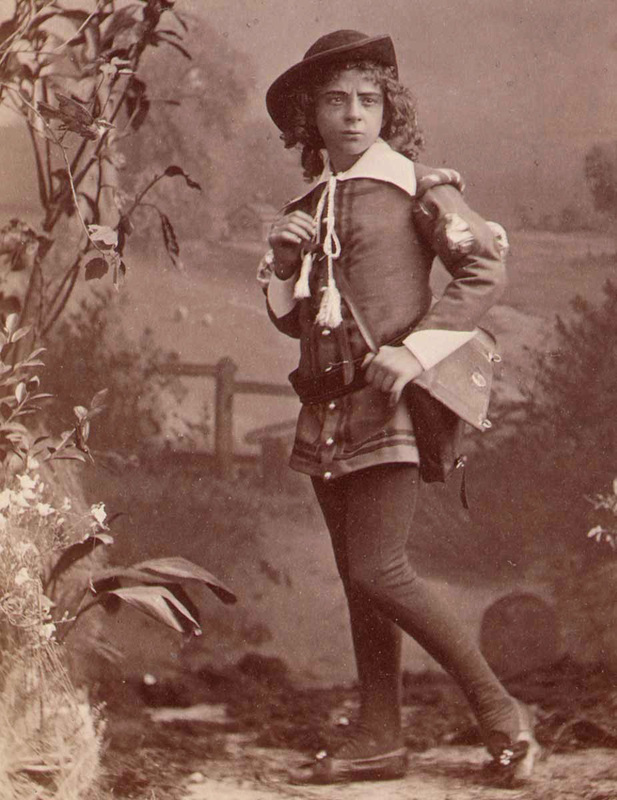 He was born in New York City in 1838 and at the age of 12 he began his career working as an apprentice in the photography studio of Silas Holmes on Broadway. During the Civil War, he came to Cincinnati in 1862 and set up a studio on Fourth Street, just opposite the Pike’s Opera House, which regularly presented Shakespeare plays. Since 1820, Cincinnati had been on the circuit of traveling troupes who also visited Louisville, New Orleans, Charleston, Savannah, St. Louis and Pittsburgh. 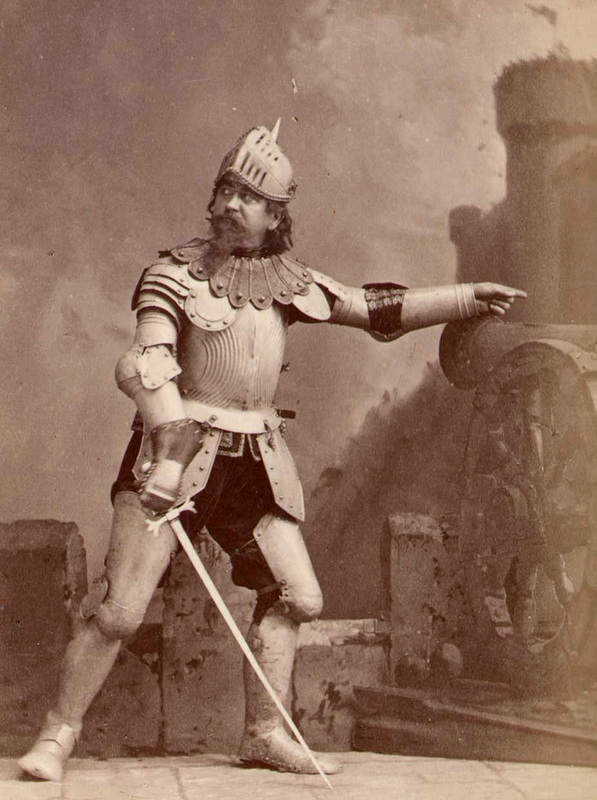 Many of the prominent Shakespearean tragedians (Othello, Macbeth, Hamlet, King Lear, and Julius Caesar being the most favored productions rather than the bard’s comedies) regularly made stops in Cincinnati and they often went to Landy’s studio to have their pictures taken for promotional photo cards. Edwin Forrest, Edwin Booth, Charlotte Cushman and dozens of other noted actors used the talent of James Landy for their portraits. He began his career making daguerrotypes and when that technology was supplanted by collodion photography, he employed that, and by the 1870s was using the dry-plate or gelatin emulsion process. Of course, Landy photographed more than Shakespeareans. He was noted for his photos of many celebrities and politicians, as well as his pictures of buildings, scenes, the businessmen of Cincinnati and the great Ohio River flood of 1884. One of his outstanding works – and still an important reference work for Cincinnati history – is his 1872 volume, Cincinnati Past and Present, or, its Industrial History as Exhibited in the Life-Labors of its Leading Men (call no. SpecCol RB F499.C5 J6 1872b). His photographs won awards in art competitions in Chicago, Paris, New York, Vienna and London. But it was his Shakespeare volume that received the most acclaim.The images were framed and hung on the walls of the Shakespeare Memorial Library in Stratford-on-Avon and the Shakespeare Memorial Association sent him an ornate letter of thanks. James Landy’s book is a beautiful volume, simply and elegantly designed. The University of Cincinnati’s copy contains the Enoch Carson Shakespeariana – Procter bookplate on the front endpaper. The cover is a ribbed green cloth with gilded lettering. Each of the sepia photographs is framed and tipped-in on heavy card stock with Shakespeare’s quotable “age” printed on the facing page. The text-block is also gilded on the top, bottom and fore-edges. And Landy’s dedication of the volume is to the Irish-born tragedian John McCullough, “in appreciation of his talents as a faithful delineator of Shakespere.” McCullough was a great friend of Landy’s and a popular actor throughout America. Sadly, his life came to a tragic end just a few years later. In 1884 McCullough was appearing on stage in Chicago when he broke down, ranting, and could not recited his lines. He was in the final stages of tertiary syphilis and would die a few months later in a Philadelphia insane asylum. His fellow actors held him in high esteem and in 1889 they erected a statue in his memory. Landy continued his career for two decades more, dying of Bright’s disease in 1897. He is buried in Spring Grove Cemetery and the book he created to venerate William Shakespeare’s lines is one of the literary treasures of Cincinnati.